An archaeologist is using it to traverse the back roads of the United States on "digs"
SiGEM, a GPS systems developer based in Canada, is using GPSy in their product development, testing, and demonstrations. We have registered users from all fifty of the United States as well as international users from the Argentina; Australia; Austria; Belgium; Bermuda; Bolivia; Canada; Canary Islands; Chile; Denmark; Finland; France; French Polynesia (Taihiti); Germany; Ghana; Greece; Hong Kong; Ireland; Italy; Japan; Kuwait; Liechtenstein; Luxembourg; Mexico, Netherlands; New Caledonia; New Zealand; Norway; Oman; Portugal; Puerto Rico; Saipan; Scotland; Singapore; South Africa; Spain; Sweden; Switzerland; Taiwan; United Arab Emirates; United Kingdom/Britain; and Venezuela. Employees of the US Geological Service; EPA; NIH; US Army and US Navy as well as the national geological services of several other countries have purchased licenses for GPSy and GPSy pro. for more details. Sponsorships usually consist free copies of our software products, consulting, and technical support, and we can also loan some of our test GPS units for short periods of time. one of the best programs out there. Set your compass to www.gpsy.com to find out more." We received 4 1/2 mice for our: "Elegant interface * Live tracking of position against background map * Uploading and downloading of waypoints, tracks, routes, and so on"
To read the full review, click on the MacUser UK site, register yourself, and then click on "reviews". February 14, 1997 by Charles Reeves, Jr.
them from the web; others I purchased on CD. cruiser. You and GPSyPro have made the whole experience safe and enjoyable. see some of the most gorgeous country on the continent ... the least we can do. shortchanged. It is reasonably priced and the author supports it totally. if you have more generic question after that. 6) Learning, playing and experimentation! more 'useful' uses for this software. underlying surface. I just wrapped it with electrical tape. use them to go four-wheeling either in my Yukon or my ATVs. The link with Street Atlas works great! impressed by how sharp you are, and appreciate your sense of humor, too! Subject: GPSy Saved My Data! data, and in a few minutes I was able to restore all of the data. see my whereabouts by the Bosphorus in Istanbul, Turkey. detail to showcase the accuracy achieved. Finally, please tell us more about the GPSy Developer Program. tracking teams in the field, etc. March, I bought it on the spot. Utterly the coolest. worked so well. I mentally pat you on the back every time I fire GPSy up. Best of luck to you. You are the best. My friends and I just love your software and how it works so well on Macs. Powerbooks just so they can use your software. Keep up the good work. getting better and better as a way for me to combine those passions. Powerbook 1400C and especially GPSY with a Garmin III did a great job. My friends were really astonished. awfull lazybones compared with you. I wish you lots of luck. I will be on your site every day. never seen graphics operate this fast. hiking, XC skiing, bicycling, backpacking). So you have another very happy user. Congratulations to the recent release of GPSy 3.0. The following message was posted to the sci.geo.satellite-nav in response to a question on GPS software for the Macintosh. It is reprinted here with permission of the author. there better options for general use than the Garmin III ? don't remember the brand, but it was made somewhere in Europe. already have ordered a number of DRG CD-ROMs from USGS. Fault near Parkfield, CA -- the so-called earthquake capital of the world. system ever used on this 20 year old vessel. and love the functionality I have with GPSy and my GPS unit. own rule of NEVER ORDER ANYTHING OVER THE INTERNET!! serial port from SoftWindows95 to receive data from a GPS? mine! Thanks very much for a fantastic Mac product!!!! Looking forward to v.3 !!! have learned all we needed to know without GPSy support. with Delorme go well. GPSy is a natural for the TripMate product. software to anyone who is interested in gps on the mac. a Magellan 4000 and a PowerBook Duo 210. 1) For the Magellan units, use the first ("raw") cable diagram in Appendix A.
GPS to use the A type with GPSy. just about wet his pants when I showed it to him! Needless to say, GPSy and GPSyLink will go with me on road trips for now on! (Now all I need it that 1 GB HDD for the PowerBook...). you to have this JPEG of one of my favorite "cats". worked and was pretty accurate. forward to the mapping functions when they become available. powered by the Magellan cable. As a boater I'm also looking forward to NOAA maps on my powerbook. extremely short with this package. 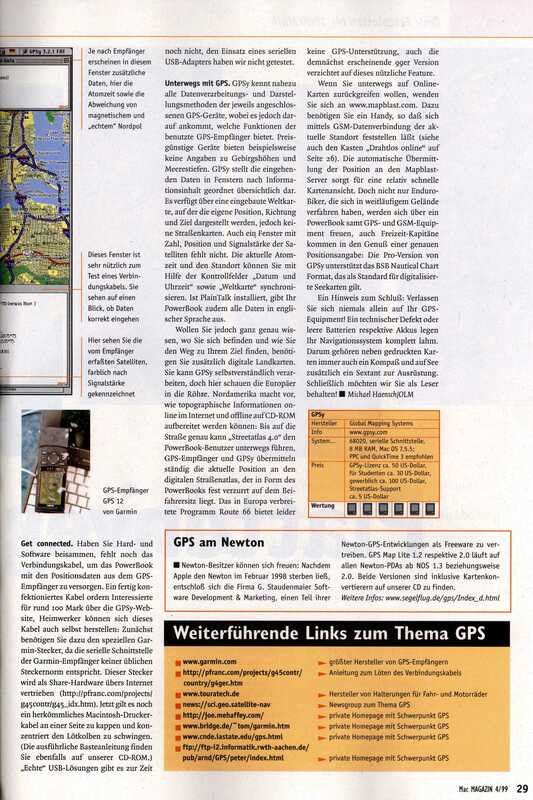 Macintosh was part of GPS History! 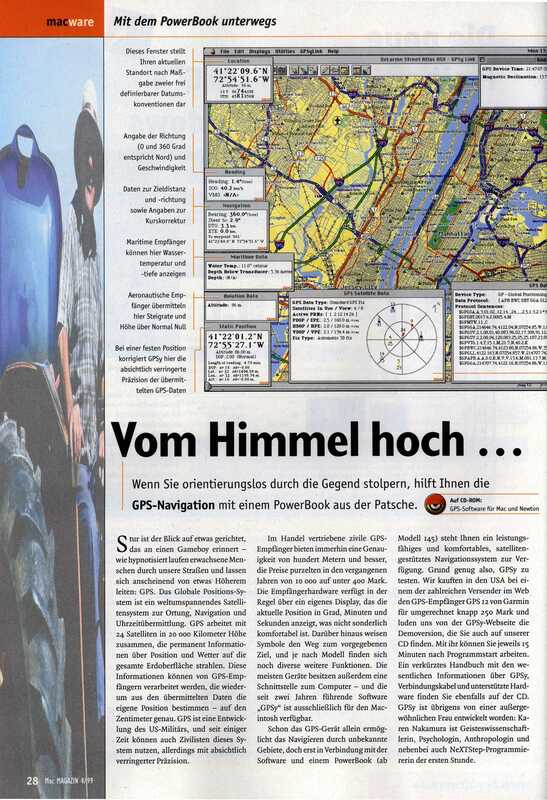 ...  Back in the '80's, I worked for Rockwell International on the GPS program. at the facility (which, at its peak, employed 5,000+ people). support was thanks to the Macintosh as well. On the kind invitation of the folks at the Shonan Macintosh User's Group (Shimayugu), and FGPS (a NiftyServe GPS Group), Karen Nakamura and Kiyoshi Suzuki were seen demoing GPSy to a crowd of Japanese, American, Taiwanese, and other Macintosh professionals. Copyright (C) 1997-2007 by Karen Nakamura. All rights reserved. GPSy® and GPSy.COM® are registered trademarks and GPSy ProTM and GPSyLinkTM are trademarks of Karen Nakamura. All other trademarks are the property of their respective owners. Mention of a third-party's product does not represent endorsement of or by that product. This page was last updated on June 22, 2000. We've had hits since we relocated on March 27th, 1997.